If one surveys a magazine of opinion, such as Ovi, among others, it will not take long before one encounters a tirade or a rebuke against religion in general or Christianity and the Catholic Church in particular. The four phenomena which allegedly inspire the attack, coming usually from secularists and positivists are: 1) The suppression of knowledge and obscurantism, 2) the required celibacy of its priests resulting in pedophilia and homosexuality, 3) the Inquisition, 4) Witch hunting and burning, 5) the Crusades. These are phenomena which go back to medieval times which in themselves are usually declared as dark times (confusing the dark ages with medieval times in general) and therefore undesirable in our modern, scientifically advanced, “enlightened” times. Often enough a recommendation is freely and egregiously offered: the Church should simply disband itself after asking for forgiveness for its crimes and hanging its head in shame, and everybody will be much better off afterward. Enlightenment and peace, transparency and liberty and integrity will then arrive on the scene and will reign supreme: a sort of Utopian Garden of Eden. If any quarter is granted to any form of Christianity in this highly Utopian world free of corruption and sin, it will be for a reformed Church, that is to say, the Protestant Churches. I have already dealt at some length with the first three historical phenomena. At times it has given rise to reactionary spirited counter-positions on the matter, sometimes those positions have degenerated into a diatribe. That is of course undesirable. At the risk of renewing such a diatribe, and in the more positive interests of free speech and truth, I’d like for the moment to tackle here the fifth of the above mentioned phenomena, the one on the Crusades and some of their assumptions and implications. I suppose the first thing that should be said about all those phenomena within Christianity is that they are historical and cannot be denied as existing at one time. To deny that is to make a dialogue impossible. But on the other hand we should remember well the fact of their historicity, that all historical phenomena are subject to an interpretation which may turn out to be correct or perhaps misleading. That an historical interpretation of an event cannot be made outside its historicity by 20/20 hindsight; its narration has to be kept within the period one is describing. 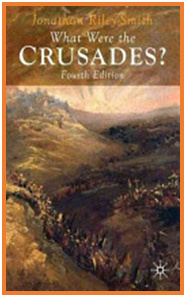 I should mention here that to insure that such was the case, I have drawn for inspiration and historical correctness from an excellent book on the subject by Jonathan Riley-Smith, titled What were the Crusades? Before we attempt an answer to such a question let us situate the Crusades within historical time. They took place within a span of approximately two centuries within middle Middle Ages, that is outside of the Dark Ages (500-800 AD) and before the higher Middle Ages: between 1096 to 1270. There were seven of them and only the first was successful as a military mission. It should be kept in mind that the Moslems, the new religion on the block attempting to overrun the whole of Europe, were already in Palestine some 450 years earlier. The unintended but more beneficial consequences were a unification that occurred among different nations and people in Europe, the economic and cultural exchanges between East and West that occurred in the defense of a common cultural heritage, Christianity. Since those Crusades had the Church’s blessing the question arises: had the Church reversed its attitude toward violence and war in general. The myth has been propagated that it did. But in fact, as the just war theory of St. Augustine and its principle of proportionality proclaims, Christianity, since its beginning, had never been absolutely pacifist. It did consider war as a last resort to be avoided whenever possible but at times preferable as a lesser evil. Even Jesus never condemned soldiers for being soldiers. This is an important consideration at a time such as ours when once again men go around in Palestine decapitating and committing all sorts of atrocities while others talk of “a clash of civilizations” and an alliance of the West which some have called a call for a new Crusade to defend the West’s values. Which brings us to the second crucial question. Who were the aggressors? Some do not hesitate to say that the Christians were the imperialistic aggressors. But wait a minute. The conflict between Islam and Christianity began not with first Crusade but with the birth of Islam in the 7th century A.D. when the Muslim conquest began encircling the West on the Western front with the conquest of Spain and the Byzantine Empire on the Eastern front. A very good case can be made that the aggressors were the Muslims, even if at first it looks as if it were the Christians who went looking for trouble and adventure in the Middle East. No historian has ever condemned Scipio the African for moving the Roman army to North Africa to finally defeat Hannibal in North Africa. All one has to do is to remember that Hannibal had already defeated the Romans three times in the Italian peninsula. The same applies to Western Europe which saw an outpost such as Vienna threatened by the Turks. That that there were atrocities committed during the Crusades is undeniable but here again we need to keep in mind that atrocities usually go together with any war. The crusades had their share of heroes and villains, saints and sinners. The Church never approved the Sack of Jerusalem and Constantinople. The Pope at the time (Innocent III) said of the incident of Constantinople “No wonder the Greeks call you dogs,” and he excommunicated those responsible. The anti-Jewish pogrom were also in direct violation of a Papal decree protecting Jews. The children’s crusade was never approved by the Church. The other myth or gratuitous charge against the Church is that it granted indulgences for evil. 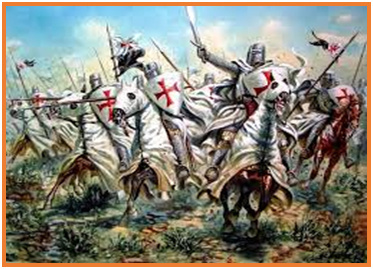 The crusades were not for the purpose of converting the Moslems. In that sense they were not, strictly speaking religious wars. More properly they were an armed pilgrimage. Moreover this pilgrimage, a holy act, was often subverted by “crusaders” with economic or political personal agendas. Blessed Urban II, the Pope who called the first Crusade never promised indulgences to all crusaders, only to those undertook the crusade for devotional purposes. Each crusader made a vow, signified by the wearing of a cloth cross, and he (or she) was rewarded with the grant of an indulgence and certain temporal privileges. 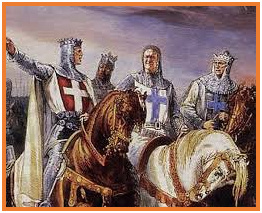 A distinguishing feature of crusading was that the cross was enjoined on men and women not as a service, but as a penance, the association of which with war had been made about a decade before the First Crusade. While holy war had had a long history, the idea of penitential war was unprecedented in Christian thought. It meant that a crusade was for the crusader only secondarily about service in arms to God or benefiting the Church or Christianity; it was primarily about benefiting himself. He was engaged in an act of self-sanctification. Those were the precondition for earning indulgences or commuting of the time to be spent in purgatory for one’s transgressions. On the contrary, it was the Muslims who promised unconditional and instant Heaven to all their war dead. The figure for the Muslim dead, which used to range from ten to seventy thousand on the basis of accounts written long after the event, ought to be revised downward. A contemporary Muslim source has been discovered that puts the number at three thousand. Three thousand men and women is still a lot of people, of course, but it is low enough to make one wonder why the Western eyewitnesses, who gloried in generalized descriptions of slaughter, felt the need to portray a bloodbath. The politically correct position nowadays is to apologize for past atrocities. But the question arises: should we be apologizing at all? No crusade was actually proclaimed against the Jews. As far as crusading itself is concerned, most Muslims do not view the crusades, in which they anyway believe they were victorious, in isolation. Islam has been spasmodically in conflict with Christianity since the Muslim conquests of the seventh century, long before the First Crusade, and the crusading movement was a succession of episodes in a continuum of hostility between the two religions. In the late nineteenth century, however, they began to regard the West's monopoly of commerce and colonialism as a change of tactics, in which everything the crusaders had lost to them was being more than regained. The crusades are merely symptomatic of a much longer-term competitiveness. 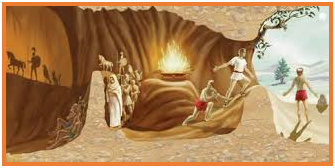 It is the Church's subjective act of repentance for past sin that matters. How useful is it to condemn wars that were supported by great saints like Bernard of Clairvaux, Thomas Aquinas, Bridget of Sweden, Catherine of Siena, John of Capistrano, even possibly Francis of Assisi? Ought we not rather challenge the widespread sentimental and unhistorical assumptions that genuine Christianity is an unambiguously pacific religion? The consensus among Christians on the use of violence has changed radically since the crusades were fought. Only in the sixteenth century did the nearly universal conviction that the use of violence depended on Christ's direct or indirect authority begin to be undermined. Now violence can be justified only in terms of the needs of the "common good," defined in relation to accepted earthly laws. Our just war theory has become so embedded in our thinking that we forget that it represents a relatively short-lived departure from a much longer-lasting and more positive tradition. The founding of the League of Nations and then the United Nations and the judgments at the Nuremberg trials encouraged the revival of concepts of natural law, manifesting themselves in the notion of crimes against humanity and an insistence on judgment by international tribunals. So, the coalition assembled by President Obama is not a coalition of Crusaders out to impose their religion and values but a coalition buttressed and justified by humanitarian aims. This development subordinates international law to natural law and reintroduces ethical judgments to just war theory. Could it be that the restoration of Christ to the position of an authorizer of violence, which was a feature of the militant Christian liberation theology in the 1960s and early 1970s in Latin America and elsewhere, was part of this process of change?